This is it, the best Chase Ink Plus business card sign up bonus offer: 70,000 Ultimate Rewards points for spending $5,000 within 3 months. How good is this deal? 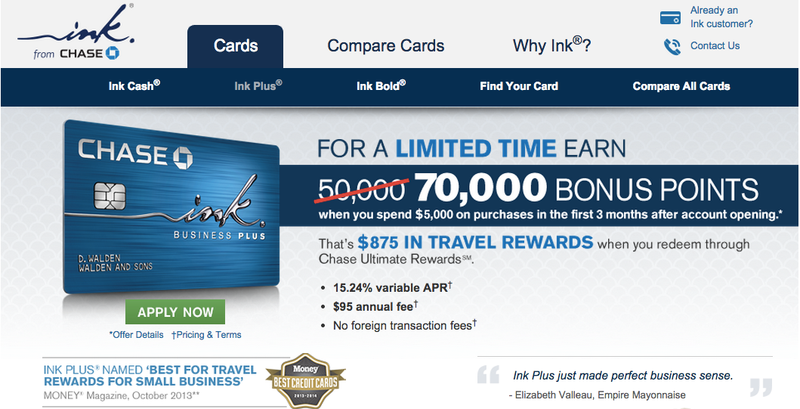 Normally, the Ink Plus offers a 50,000 point sign up bonus. With this new promotion, you get an extra 20,000 Ultimate Rewards points, worth at least $200 cash (much more if redeemed for airline miles). This card has a $95 annual fee, and it is NOT waived for the first year. This being said, the extra sign up bonus points are well worth the $95 fee. Heck if you wanted you could redeem 9,500 points to cover the annual fee, and you would still be up 60,500 points! You all know how much I love Chase Ultimate Rewards points. We usually transfer our Chase points to Southwest Airlines or United Airlines for free travel around the world. The Ink Plus and Ink Bold cards are hands down the best business credit cards available. Oh and by the way, I just applied and was approved for my own Ink Plus! You can apply for your own Ink Plus here (my friend’s referral sign up) or directly at Chase.com. The promotion ends October 20th.